Brittany Ferries offers this no-frills but yet comfortable throughout ship travelling from Portsmouth to both Santander and Le Havre. Etretat can carry up to 375 passengers and 200 vehicles in its garages. On board facilities include a self-service restaurant, a bar, games room, boutique shop, movie lounge and there are 103 cabins of differing sizes to choose from for a relaxing and comfortable stay. There is vast array of cabin choice available onboard, with the Etretat offering 4 berth inside and outside cabins, some of which are pet friendly and all are equipped with ensuite facilities and are air conditioned. Cots are available on request. Disabled cabins are also available. 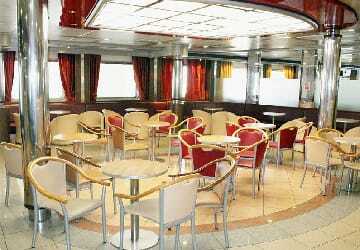 If you would prefer not to book a cabin there are seats available in the ships lounges. The ship is wheelchair friendly with disabled parking available close to passenger elevators as well as specially fitted cabins. Please contact the operator prior to your departure if you need these services. Please Note: Whilst we have taken great care in making our Etretat guide as accurate as possible, onboard facilities, services and entertainment may vary depending on the date and time of year that you travel, facilities mentioned may change without notification and ferry companies reserve the right to operate vessels other than those mentioned at time of booking without prior notification. The boarding and dissembling were well organised and completed promptly. However it was a little scarf as the ramp onto the deck was very steep. We went to the restaurant where there was a good choice of meals and excellent service. 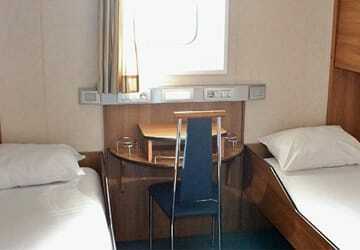 Our cabin was very clean with quite comfortable pillows and we had a good night's sleep. As I am not a very good sea traveller this was an ideal way of doing the crossing and we will be doing the same trip next year. On the trip to Le Havre (8 + hours) I had a reclining seat and dozed for the majority of the trip. The return trip was just as comfortable - the channel was choppy and the crossing rolling but felt comfortable the entire journey. All the necessary amenities were present (Bar, restaurant, etc) and the boat was clean. So will use the same ship the next time I sail to France. Best trip ever, nice and clean, nice cabin. Better than LD Lines. 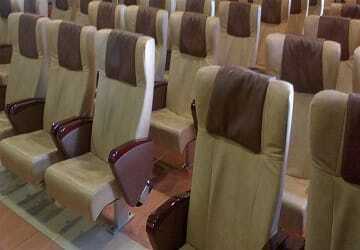 No problems on outgoing trip, good service and comfortable. Return trip slightly marred by lack of information and facilities at Le Havre. Terminal building some distance away from entry pointo and no facilities available when we found it. Otherwise, comfortable cabin both ways and good food on return journey. Will probably use this service again. It was a very good travel on your ferry boat. The restaurant was open, we really appreciate your service on the ferry boat. Just we had a small duvet on the bed so too small for an adult. Most helpful booking and service.will sail again with them! 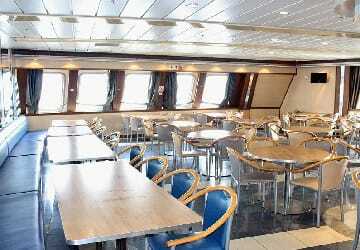 Easy to book the crossing: no problems in boarding and leaving the ship. "Return trip to the UK"
Loading and unloading of vehicles was quick and efficient, ferry was very clean and reasonably comfortable, staff efficient and pleasent. We very much enjoyed our trip , the food was good and the staff were always available and very pleasant. However we did notice a distinct smell of sewerage throughout the ship. Our only complaint. It would be great if the ferries had charging points for hybrid cars. Your staff on the day made every attempt to accommodate my Mitsibishi Outlander Phev but in end had to admit that there was no available charge points. These cars have been around for sometimes now so let's hope providers including yourself are looking at making this facility available on current and new ferries at the point of booking, it's the future. "Brittany Ferries - comme d'habitude, as good as ever"
As usual, no fuss, fair price, comfortable cabin, please keep up the good work. Quick and easy boarding, in hindsight a cabin is a good idea although there were plenty of places to sit. So glad I booked the overnight trip with cabin. Made the long drive to the west coast of France much more manageable and far more pleasant. The cabin was comfortable although very basic - but as all we were doing was sleeping for 7 or 8 hours that was absolutely fine! Tea making option would have been nice. 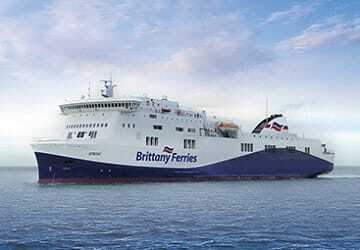 "Pleasant trip with good food on Brittany Ferries"
We took the overnight ferry on the outward journey, the reclining seats were very comfortable and the food was very good, the return was an evening trip and the experience was just as good.